In the video, I’m a bit over-enthusiastic in signing ‘dangerous’. Really, doing two shakes of my hand is more correct. Note, this is similar to the sign for ‘sorry’, but with ‘sorry’, your fingers are more spread out. Also, when I do the sign for ‘enough’ I should have just done two rotations. This entry was posted in Learn Auslan Online and tagged Asphyxia Auslan course on May 1, 2017 by Asphyxia. Learn Auslan pronouns. In Auslan, pronouns are not gender-specific. Mostly, they involve pointing at a person or object. When using these words in conversation, point to the person or thing. If the person or thing is not there, invent a location for them them in space and make sure you continue to point to the same spot for the rest of the conversation. You might notice that it can be pretty hard to understand sign language if you come in on a conversation in the middle. That’s because often a speaker will set up spaces and words at the beginning of a conversation, and then just do a lot of pointing to convey meaning after that. This entry was posted in Learn Auslan Online and tagged Asphyxia Auslan course, Learn Auslan pronoun, online sign language on April 24, 2017 by Asphyxia. This entry was posted in Learn Auslan Online and tagged Asphyxia Auslan course, Australia sign languages, communication sign language, Learn Auslan online, sign language on April 17, 2017 by Asphyxia. This entry was posted in Learn Auslan Online and tagged Asphyxia Auslan course, Australia sign languages, free Auslan, free Auslan course, Learn Auslan online on September 12, 2016 by Asphyxia. This week’s Auslan signs are a mixed bag. We’ve got some major international cities, and some signs to help you communicate about the weather. This entry was posted in Learn Auslan Online and tagged Asphyxia Auslan course, Australia sign languages, free Auslan, free Auslan course, Learn Auslan online on August 15, 2016 by Asphyxia. This entry was posted in Learn Auslan Online and tagged Asphyxia Auslan course, Australia sign languages, free Auslan, free Auslan course, Learn Auslan online on August 8, 2016 by Asphyxia. When I was growing up, my deafness was marginally more interesting to me than, say, my freckles. It was not something I focussed on, nor was it central to my identity. I just accepted that I was ‘damaged goods’ and assumed it would take a very kind person in my future to marry me! These days my take on Deafness is very different. 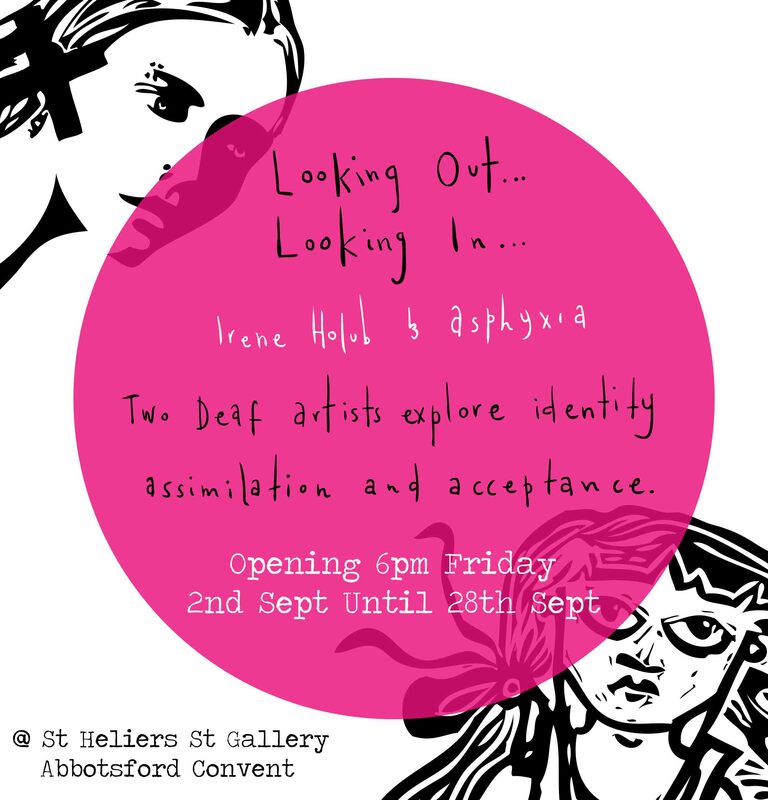 I’ve been exploring what it means for me to be Deaf, and together with Irene Holub, have created an art exhibition which reflects this journey. If you’re in Melbourne, I would love you to come and see it. Exhibition runs until 28th Sept. This entry was posted in All about Deafness, Art by Asphyxia, Learn Auslan Online and tagged Asphyxia Auslan course, Australia sign languages, free Auslan, free Auslan course, Learn Auslan online on August 3, 2016 by Asphyxia.